Back in October, Trust Performance released their multi-link suspension fork, the Message. Since then, Mike Levy has been putting it to the long-term test. In the meantime, it's been nominated for a slew of awards and accolades for its innovative design. The Message is a multi-link design front suspension "fork". In contrast to what we're used to seeing, a traditional telescopic fork, it lets the front wheel move up and away from an object, rather than just up. Plain and simple, it's really different than what we're used to and in addition to big claims of how it can improve the ride of a trail bike, it comes with a hefty price tag of $2,700 American dollars. The crew at Trust, along with several leading bike shops have partnered to launch a demo program in the United States to allow riders to experience the fork for themselves before shelling out what many people spend for an entire bike, or a month's rent for a room if you live in much of California. Trail Head Cyclery in Cupertino, CA, Arizona Cyclist in Tucson, AZ and Worldwide Cyclery West in Newbury Park, CA and Lancaster, PA are now Trust Performance’s first authorized demo partners offering riders the opportunity to demo Trust Performance’s multi-link front suspension design, the Message. 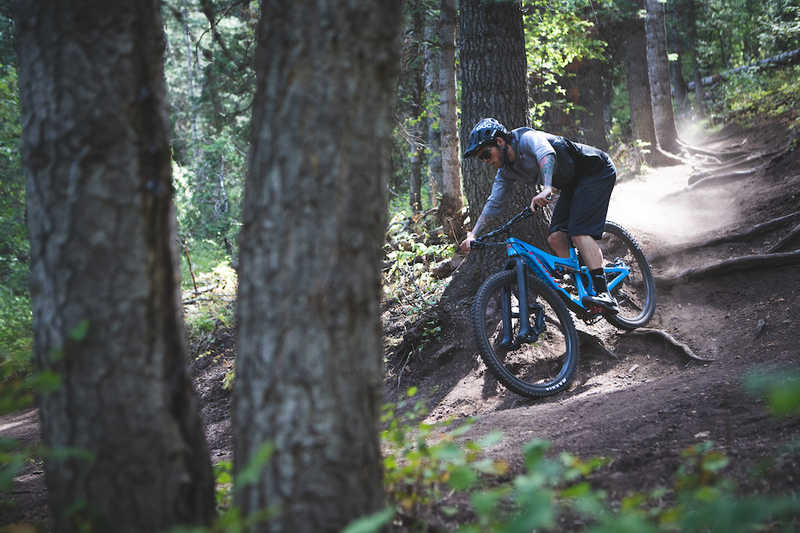 I spent some time talking to Lars Thompson, the owner of Trailhead Cyclery about the Message and why they chose to implement such a niche product into their demo program. Lars has been around the mountain bike industry for years and when it comes to trends and what is or isn't an innovative product, he's someone that I would trust. Thompson says that to him, the only way someone would ever consider purchasing the fork is if they have ridden it and understand what it's about. He said, "It's not what I'm used to, or what anyone is, for that matter. You have to ride the fork to understand what it's doing. It's a complicated piece of suspension." How does the whole demo program work? 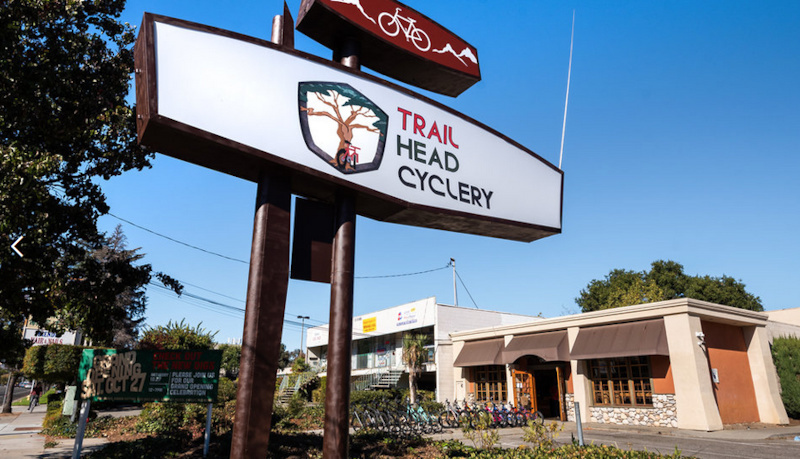 Well, at Trailhead, Thompson said that for $100, a rider can have the Message installed and set up correctly on their bike by THC's staff. Then, they have five days to see what the fork is all about as long as it's back before the shop closes. The shop also offers the option of taking the fork out on one of their demo bikes. The bikes are typically reserved at the rate of $90 but, you can ride a high-end bike and the Message for $150, for two days, total. So, now anyone can try out Trust's Message, given that you have $100 and an afternoon near one of the demo shops. Riders can draw their own conclusions as to whether the Message is worth $2,700 and the hype. I Trust myself enough to know I’ll never pay anywhere near this for a fork. Bruh an we be frenz in the real world? This is what I’m saying. Y’all enjoy your eBike shuttle whatever, good for you. I choose a steel hardtail for reasons like this. @SRSuntour DTYD sends the fork to you, lets you use the fork for 3 weeks AND lets you use all of that toward the purchase of a new fork or will refund it. @DONKEY-FELTCHER: I'm assuming it's "demo til you decide"
Sorry I don't have the link, but there was a review posted by someone who used the Trust fork and didn't like it. Trust basically told the person they were stupid and didn't know how to setup a fork. I imagine they want to have a shop setup the fork according to their specs vs sending out the fork and receiving less than glowing reviews. At this point it seems the reviews are mixed. Those who buy the fork have high praises probably justifying the price. While those who demo the fork may not have quite as glowing reviews. Jesus, $100 to demo a fork? I thought these guys were starting to come around and planned to provide free demos at each of those locations, just so more people could experience the Message. Silly me. $100 for a demo from that shop is pretty fair. That bike shop, which I'm sure is ludicrously nice, is in Silicon Valley. Land of the $2-3 million 1500sqft. houses, and $10 lattes, and what I can only assume is a pretty hefty lease on the bike shop space. Yeah that shop is ludicrously nice. @scottzg: and it's going to go under, ludicrously fast. I live 5 miles away. They are missing the boat for the demographic here by a lot. @conoat: Yeah, used to be 5 minutes from my house. Perfect demographic over there, but now it's just a lot of techies looking for commuter bikes. If they had events at Apple or Google to get some more techies on bikes they'd be doing super well. They do have a strong following through which helps. Pay to demo, no, hell no! And on goes the list. It’s easy to naysay and armchair engineer when you don’t know a thing about what it’s even like to design and think what’s next. In a day and age where 1% improvement and color changes are the story of the day it’s easy to let that dictate what normal is. Reality is you’re being sold daily on all these sites what the companies with the money and resources to influence tell you is what you should have. What you need. And what is that on average? Hmmm? That saving 70 grams somewhere is worth $100? That the $500 price gaps between top end and the 3rd level down are big enough to justify the cost? $60 bottle cages and $120 headsets?? Matching enduro blue shirts, gloves, shorts? Shoes, and helmets at a few hundred each? You add up all that you pay way too much for and start with the best fork you can afford that’s then custom tuned by somebody like Dirtlabs or if you can...the Trust fork. Take that $6k budget or so you have for a new bike and start there vs the $3000 carbon version of a frame that weighs basically only a 1lb less at best than a $1700-$1800 aluminum version. Hell, go to a hardtail even. Then see what you can afford for wheels, brakes, drivetrain, and such. But who makes money off you that way eh? Not Shimano or SRAM the two deepest pockets in the biz. Follow the money. As someone who has demo’d this without having to pay $100 to do so, I can humbly say it’s not worth it. This is an XC fork better suited for smooth singletrack. Technical chunky terrain owns this fork. I couldn’t put my DVO back on soon enough. Was yours setup by them? Reading one of the reviews that seems to be their come back. Not set up by us = fork will feel like trash. Thanks for throwing your opinion out there. We need more unbiased info about this product, and the price is definitely making that difficult. And we really need people to stop talking about the fact that its different. Yeah no kidding. But is it better at suspending the front end of a mountain bike? Didn't even have to test it to realize this. 130mm travel is not enough for trail riding. And no, a 130mm fork cannot act like a 160mm fork, no matter what the configuration is. I really hope we see a huck-to-flat video of Levy on this fork. That's almost 25% of what I payed for my last fork. Thats great at all, but if you're the type of person that is considering a $2700 fork, putting $100 towards seeing if you like it is probably not going to hinder them. @Soilsledding: Seriously... is their strategy to make 40 of these 'forks' a year and count on elitist, unobtainium, "you want it but you can't have it-" psychology to persuade the average guy to sell his bike for funding... then clamp on an old handlebar and pogo-stick around the driveway in "Emperor's New Clothes" hallucino-rapture? Please vote this comment to the top. hell its 50% of what i paid! @Soilsledding: the $ certainly is going to the shop to cover their expenses in labor, but I wonder if the shops outlaid $ for the forks or did trust loan them? Either way I agree this is a terrible way to get their fork out there. I mean just off the top of my head, what if they sent the forks out to Velofix accounts? Partnered with XYZ’s demo fleet? The price is ludicrous and the service model is plain stupid. Even if it was created by the lord wizard dw! I honestly think a whole bike demo is less complicated and time consuming for a shop. @eoisaacs: clearly you’ve never tuned up a demo after some clown trashes it for a few days. Cause it’s not his bike. @bubbrubb: I've tuned up a lot of single-day demos and a few multi-day. It's usually just a quick wash, check the brakes, adjust shifting. No biggie. For a fork demo I assume you would have to swap crown races, front brake (inc. any necessary adapters), add headset spacers if needed, etc. $100 for them to tell you that apparently you "didn't get the message" about how suspension is supposed to feel. bring these forks to outerbike...i'll be the overweight bluecollar judge this website needs. This review seems to uncover some weaknesses in the fork...and the people at Trust. Summary: The guy didn't like it. Trust said he and the other testers (all seasoned pros and very technically proficient) didn't know what they are doing. If i wanted to pay $100 to demo something to get laughed at on the trail id just try a fat bike. Get laughed at until you speed ahead of them..... If this works as it says. Is that Hap Seliga's "gettin' sendy" alter-ego: Gap Seliga? "In contrast to what we're used to seeing, a traditional telescopic fork, it lets the front wheel move up and away from an object, rather than just up." For Euclid's sake, try again. Why no demo shop in their hometown of SLC? $100 is demo price for a $6k bike. Seems a little steep for a $2.7k fork. @eoisaacs: Most likely not going to install it on your bike. This would require different steerer lengths. But, you can ride on of these new fancy ___10k bikes with the fork equipped on it. @Soilsledding: It literally says in the article that they will do exactly that. @eoisaacs: The demo bike doesn't get a minor tune when it comes back? And an hour to swap a fork seems a bit much. I guess I'm not being realistic here though: if someone's in the market for something like this they probably give approx. zero f*cks about the demo cost. @sspiff: between crown race, headset, and front brake in addition to setup I think 1 hour is pretty reasonable. If they didn’t charge for the demo, there would be little incentive for a shop to do it. This is the future of front suspension no doubt, just a high price and limited travel options is limiting. This doesn't look that bad, and you cant argue with rear suspension like suppleness on the front, with an axle path that improves stability. Don't think this is the future. Maybe for XC style bikes, but there is no way you are ever matching the stiffness of telescopic forks, especially dual crown, with this type of design. Wow, a whole article about two bike shops on the same coastline. Looks like pinkbike will take any excuse to promote this stupid fork. If you want me to think that fork is worth $2700, asking me to pay to find out is definitely not the best approach. The more I hear about the message, the more I hope it fails quickly. wishing new tech to fail, is idiocy. it either fails or succeeds on it's merit, not on your preconcieved notion of what things should cost. "Trail Head Cyclery in Cupertino, CA, Arizona Cyclist in Tucson, AZ and Worldwide Cyclery West in Newbury Park, CA and Lancaster, PA are now Trust Performance’s first authorized demo partners offering riders the opportunity to demo Trust Performance’s multi-link front suspension design, the Message." Demo program available in Cupretino, CA, home of FAANG execs, the demographic with the disposable income to drop on this interesting fork.